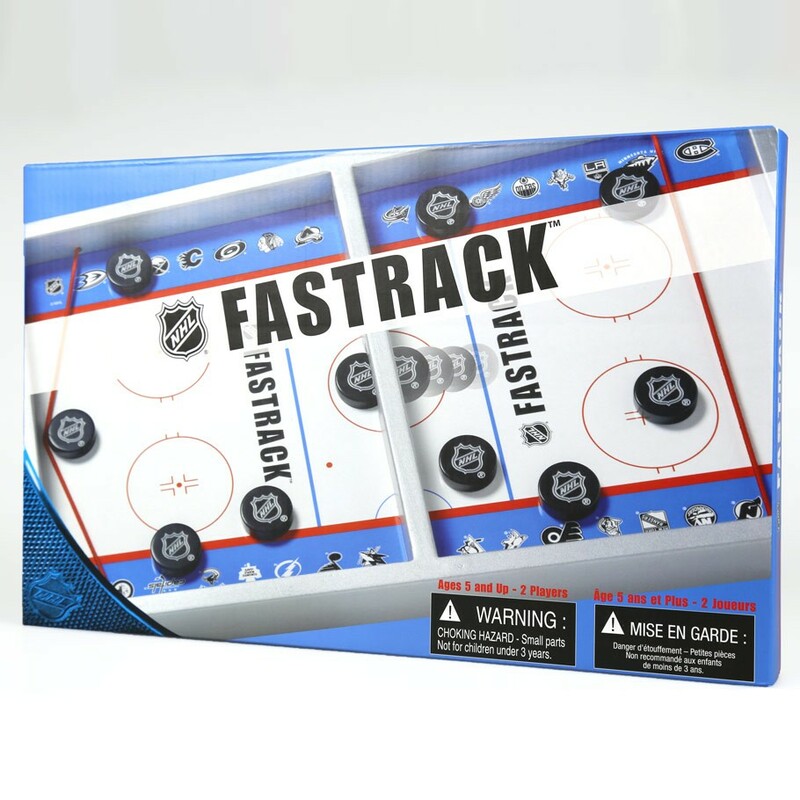 NHL Fastrack brings your favorite sport to your fingertips! 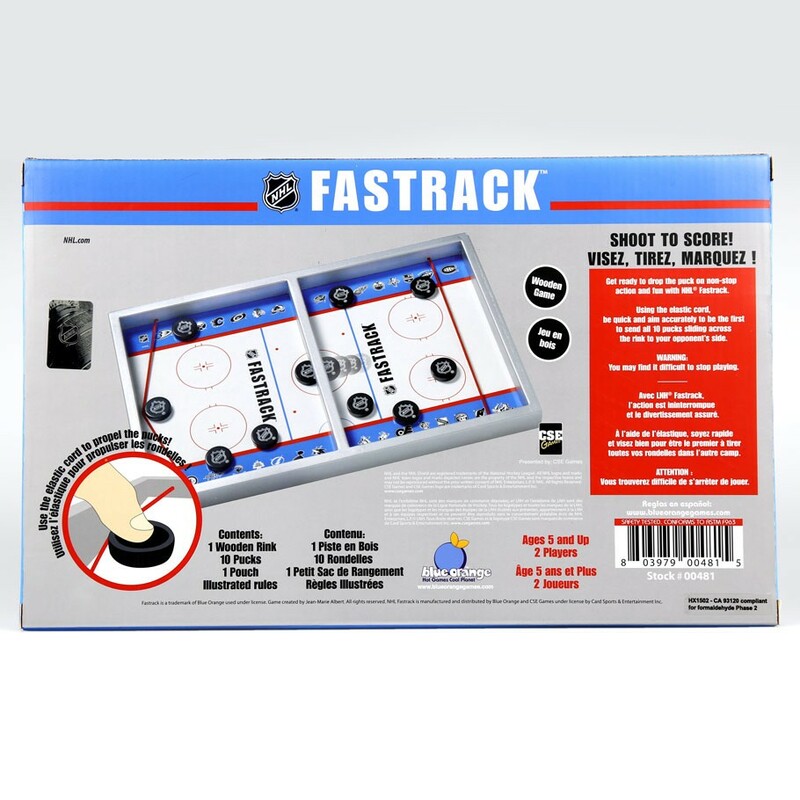 Officially licensed by the National Hockey League, this frantic game of puck passing produces kinetic energy and exhilarating competition. The game consists of a special NHL branded wooden tray, detailed to replicate a real hockey rink, and a high-gloss finish makes it look slick as ice! A middle bridge with a slot opening divides the zones and an elastic cord stretches across each goal line. The sidelines of the rink feature logos of teams adored by hockey fans all over North America. Each side starts with 5 resin pucks, engraved and hand painted with the NHL logo. Using one hand and the elastic cord, players simultaneously shoot the pucks through the slot and to the other side. The first to send all 10 pucks to an opponent's side wins the period. The best of three periods goes home with the winning trophy! The game takes skill but also luck, as pucks ricochet off the sides, each other, and sometimes off your opponent's band and back to your side! Just like a hockey game, NHL Fastrack calls for lightning-speed, accuracy and just the right amount of chance to win.